...then you'll go back to whatever you started with. So, if you have a bunch of commands that you run over and over, just save each command in a text file on its own line and make sure that file has the .ps1 extension when you save it. After you've saved your script, like script.ps1 for example, there are multiple ways to run it. AllSigned Requires any .ps1 script to be digitally signed from a trusted publisher. Bypass Any .ps1 script should work. Default Sets the ExecutionPolicy to Restricted. RemoteSigned Requires downloaded .ps1 scripts to be digitally signed by a trusted publisher. Restricted This basically blocks all .ps1 scripts. 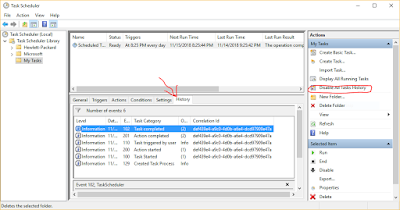 Undefined Removes the current execution policy unless it was set by Group Policy. Unrestricted All .ps1 scripts should run but download .ps1 scripts prompt for permission. If you want to unblock a downloaded file because you're sick of being prompted about it, you can use the Unblock-File cmdlet. If you want to run a PowerShell script by clicking an icon, you can. But only if you right-click the icon and choose "Run with PowerShell." Here's something to notice regarding almost any script in almost any scripting language: The purpose of a script is to execute all the commands as quickly as possible and close the command line window. If your script runs quick and closes before you can read anything, that's exactly what it's supposed to do. If you want your script to stay open after execution, use the PAUSE keyword in your .ps1 script. 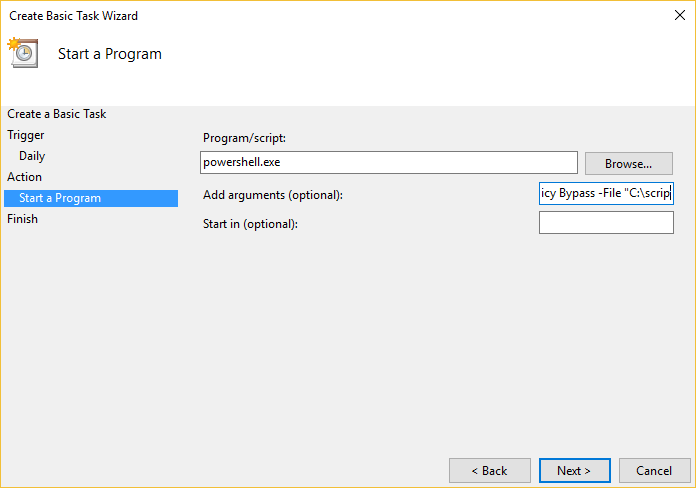 If you're running your script from the old Command Prompt, make sure to tell the Command Prompt to execute the program called "powershell.exe" and give that program an argument which is the path to your script. Write-Host "This sentences is from script1.ps1." Write-Host "This sentence is from script2.ps1." Remember when using the old Command Prompt, you have to use powershell.exe to run PowerShell? 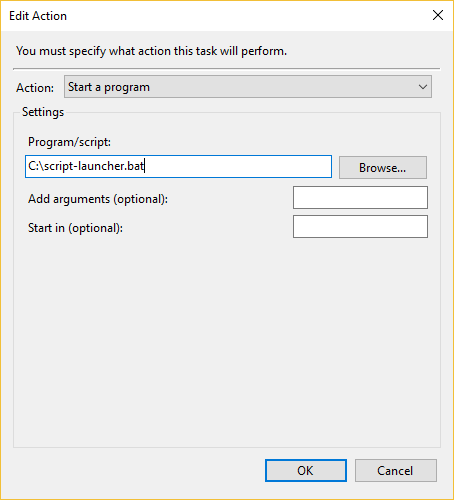 Batch scripts use the old Command Prompt technology to run so the same rule applies. 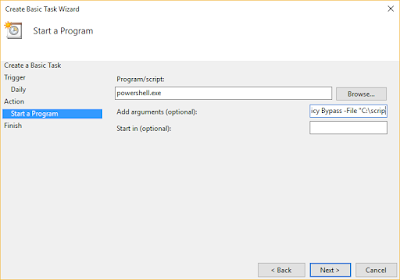 Here's a few examples of some batch scripts used to run PowerShell code. 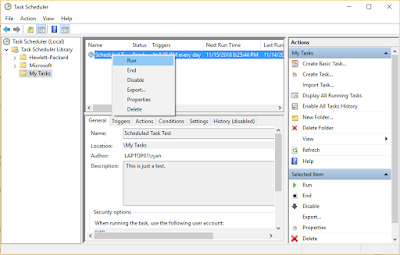 The cool thing about writing a batch script to execute your PowerShell script is that you can just double-click the batch script instead of having to right-click and select a context menu option to run the code. 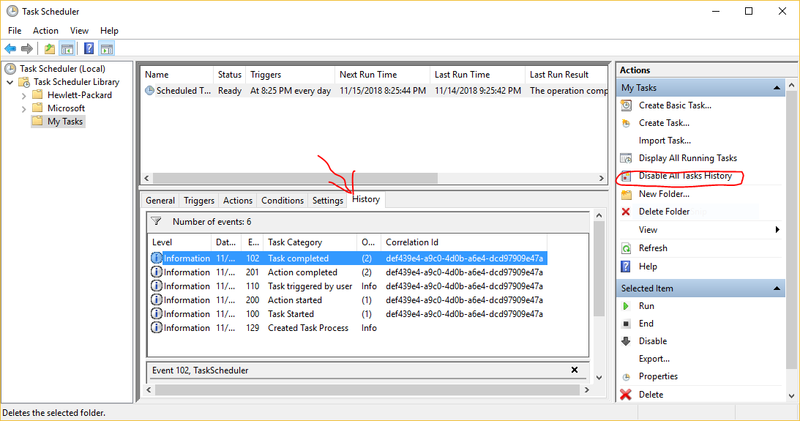 ALSO, if you need to run the batch script as Admin, you can do that just by selecting the "run as Administrator" context menu option unlike with PowerShell scripts. To run a PowerShell script as Admin, you'd have to open a new PowerShell window as admin then execute your script afterwards. Making simple batch scripts to launch your PowerShell scripts just makes things easy. POWERSHELL.EXE "Get-Process | Select-Object -First 5"
Notice that I pass the argument Bypass to the parameter -ExecutionPolicy. This way, I don't have to know what the ExecutionPolicy is on the computer that will be running this .ps1 script. 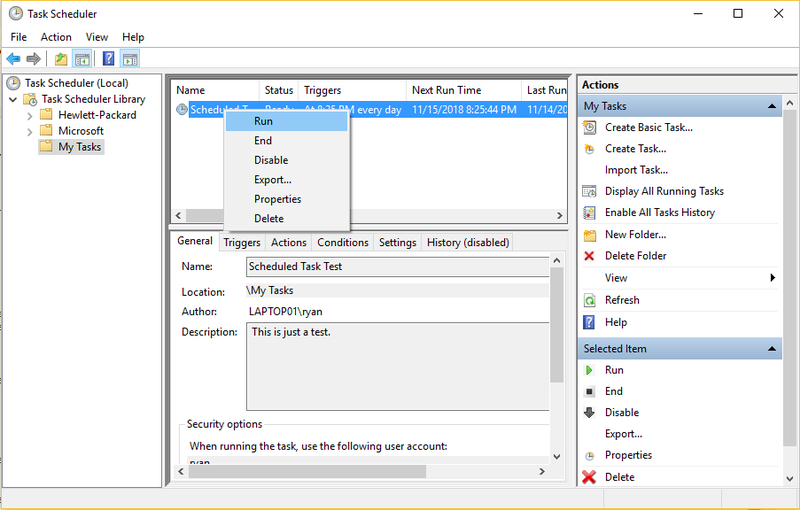 If you want the computer to execute your PowerShell script as a scheduled task, you have a few options. 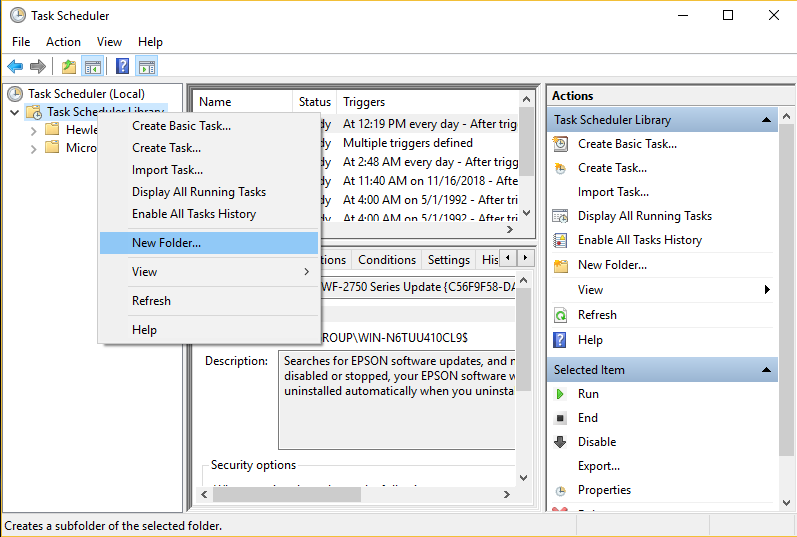 First, I recommend making your own folder in Task Scheduler by left-clicking "Task Scheduler Library" then right-clicking it and choosing "New Folder..."
-ExecutionPolicy Bypass -Command "C:\script.ps1 -MyParameter myargument"
Leave the the third text box blank - the one that says "Start in (optional)." Now to test your script, you don't have to wait for your time trigger to elapse. Just right click your task and select "Run." If you have trouble with your task, check the history tab. 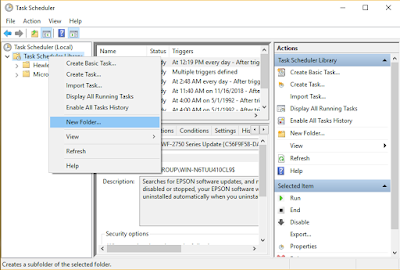 If history is disabled, you can toggle that setting on the right under "Actions." Now you know all kinds of ways to use PowerShell. I did leave out one last way to use PowerShell - by using modules. It's a little more advanced so I'll write that in another post. Good info here, Ryan. Thanks for the post!